OK so i have been posting on and off recently quite a lot, initially when I was researching different aspects of the car whilst looking to buy and then more recently following placing a deposit through BMW having found an AUC car however I haven't written much since delivery. I hope this thread will be somewhere for me to document my journey, experiences and also little mods and changes I do along the way. To kick off I will cover what went before which was a 2008 Mercedes ML320 Edition 10 which was great to be fair, couple of the regular problems they seem to suffer with but day to day living with the car and as a family load lugger it was ideal. My only gripes were it was one of the plastic generation Mercedes with no tactile finish to the interior whatsoever and I didn't chose a car which had heated seats but thats my fault. That had to go and whilst deciding what to buy next I chose to run around in a 2009 Abarth 500 Essesse which was very different from the Merc but so much fun its unreal!!!! Like a race from Mario Kart everytime I went out in it! Then I saw what I thought was my ideal spec X5 advertised through BMW, I was quite specific about colour more than anything - I didn't want silver exterior or grey really and definitely didn't want black leather as I felt with the anthracite roof lining, black dash, carpets etc. it was all a bit gloomy which is something the Merc suffered with to a huge extent. The car I saw was a 2010 30d M Sport in Carbon Black with Camel leather interior, a colour I hadn't seen before but was the perfect contrast to the exterior colour and gave a real nice ambience whilst inside. It had a few nice options on it as you can see from my signature, and obviously came with the AUC warranty, recovery etc. The car was on the outer limits of qualifying for the AUC scheme however I was reassured that this was due to to its cosmetic condition and mechanical excellence. I should probably point out that due to hospitalisation I was prohibited from long periods of driving/concentration which meant this purchase was to be done from home without seeing the car until it was paid for and on my driveway. The process of trying to buy the car was most frustrating and the dealers appeared dis-interested in returning my phonically, providing very simple information about the car or general keeping any promises they made to me on the phone. Alas I persevered as the car was the only one i could find through AUC that had a desirable (to me) colour combination and the added bonus of some nice extras. On some occasions the only way to get a phonecall/email reply from the dealership was to Tweet BMW UK who then contacted someone to instigate a phonecall/email. Dozens of empty promises about information that would be provided, people that would ring me it was just a long drawn out and totally frustrating process. That being the case you would expect that the delivery, prep and presentation of the car would be spot on - sadly not! Delivery driver was supposed to arrive between 11.30-12.30, eventually arriving at 14.30 and messing up the collection of my daughter from school and gymnastics run. Numberplates were absent which had been promised. Car not valeted - food in armrest and front thigh bolsters, sticky marks on dash/iDrive controller. Wheels poorly refurbished with one in particular having a large bubble/blister under the paint ready to burst and allow the weather in to ruin the rest of the paint. Old corroded centre caps and no 'M' badges on the wheels. Heavily marked aluminium dash/door trims, not just a 'couple of marks' as described in the salesmans video we are talking about dozens of tiny chunks out of the surface. White paint on the steering wheel. The whole thing was a farse, I quickly made contact with the dealer to address these issues and some they accepted had 'fallen short' of BMW's exacting standards and badges, roundels would be sent out in the post however they felt the marked interior trim was acceptable given age/mileage of the car. No flexibility or compromise on this initially and at one stage they were collecting the car back from me for a full refund, however common sense stepped in and they realised there was a cost implication regarding collection, resale, prep etc. Eventually they agreed an allowance for me to purchase a full set of trims from a BMW breakers to replace the ruined ones n the car, these turned up yesterday and some of you may have seen that I am busy stockpiling advice and YouTube videos about the process. The dealer and I have finally nearly concluded out business and once the payment drops into my account from them for trims and wheels, the other items arrived earlier this week, that will be the end of my dealings with them. Lessons learnt that's for sure and my advice to anyone else considering an AUC is to inspect every inch of it and don't just take salesmans word for it or 3 minute video. My situation dictated I couldn't travel to the dealership to view but felt comfortable it was a large main dealer and very minimal risk. If you don't have to buy a car blind don't - make every effort to see it in person. So it’s a 2010 semi LCI 30d M Sport, when I say ‘semi’ it has the newer sat nav and iDrive control but not 8 speed box, bumpers etc. It’s as mentioned Carbon Black which I am a big fan of particularly when clean and in the sun, it has a very marmite interior of Camel leather. I particularly like the exterior colour and interior colour to contrast and this was no exception, hard to capture the colour but not beige, not cream more a caramel I guess. Externally it’s fitted with shadowline extrior pack, privacy glass, roof rails and that’s about the lot although underneath it does have Dynamic Drive. Interior is currently brushed aluminium but soon to be changed out for piano black which I am looking forward to! It has head up display, heated seats, high beam assist, some upgrade of audio although not HK or Logic 7, dubious ‘ambient lighting’ package, electric memory seats, cruise, mfsw and that’s about the lot. 2010 Range Rover Sport - love these but couldn’t afford one through LR Dealer with warranty so non-starter. VW Touareg - couldn’t afford an R Line and in lower trim wasn’t a fan of styling. Merc ML350 CDI - owned a 320 and other than some mild styling changes it felt like sitting in the same car. Disco 4 - Bit too agricultural for me and also similar issue to RRS above. Audi Q7 - far too big and budget only reached early models with 100k +. So after trying a few I settled on the X5 and so far it seems a good choice, comfort of AUC warranty for 12 months which is good, MPG I seem to hover around the 27mpg mark no matter how or where I drive it which to be fair for such a big car I am pretty pleased with. Please excuse the missing headlight washer cap, it went AWOL however after BMW relieved me of £30 and then bodyshop £15 to paint it - it shall be fitted tomorrow. Also purchased and OEM secondhand grill off eBay which I have split and outlets have been painted CB to match bodywork, they will be reunited with satin black inners tomorrow and refitted so pics to follow! Last edited by Sit on Thu Nov 16, 2017 7:50 pm, edited 1 time in total. Nice writeup, this seems to be a common complaint about dealers and AUC cars. I've read similar posts from members purchasing ill prepared AUC cars. The dealers seem to think they can sell cars without fully checking and preparing them, hoping the warranty will pick up the bill. Well done for standing your ground and getting them to put things right. Thanks bud, it’s the first car I bought from a dealers and in a way I was quite looking forward to it, but sadly it fell well short of expectation. They finally paid me the last agreed amount for putting right what should have been correct in the first place so no further contact required with that dealer. In complete contrast I ordered a boot liner from Cotswold BMW and they were superb, swift, polite and efficient with it turning up the next day!!!! Does look a very classy colour combination & very nice looking car, real shame about the AUC preps however on the positively negative side at least little was covered up & you received aunatural, as frustrating as it is! Thanks bud, I guess that’s one way to look at it - warts and all!!! Putting all that behind me now and looking forward to onward ownership. Will try and keep this thread up to date with progress, changes and experience. Ok so on the way to the bodyshop to pick up grills and washer jet cover I hit the X5 whilst swerving into a gap between parked cars, car coming towards me in middle of the road not slowing down, no intention of stopping. Swerved into a small space but to tight and caught rear n/s arch extension - SO angry!!!! No major damage and lady who owned parked car was lovely about it. I bought my 2002 4.4 from Cotswold in 2006, an AUC with 42000 on the clock, Titanium silver with Pastel green montana leather interior, a lovely combination. We looked at the black cars with dark interior and the wife's comment '' it's like a funeral car'' salesman face a picture!! Have had dealings with Cotswold since and I certainly rate them for a friendly and trustworthy company who do what they say. Thanks for your thoughts - going on current performance, as and when the X comes up for change I will definitely look to visit Cotswold; totally different customer service ethos to Sytner Harold Wood where I bought the car. Ha I didn't realise, as previously owning an E46 M3 I was a member of M3 Cutters and used their thread to source my parts!!! LOL!! Do they have a similar thread/area on here? So few updates and considerations, I have the BMW boot liner which I mentioned above. I have bought these for the last few cars I have owned mainly as we have a dog crate which sees occasional use coupled with welly boots, scooter/bike for my daughter and the boot in the X5 was very clean. Normally I order one up from a previously used seller on eBay however this time I thought I would use BMW OEM liner, it’s amazing! If your thinking of buying a boot liner, buy OEM - it cost me £57 with next day delivery, it fits perfectly, super tough material, ‘BMW’ embossed in the middle - you open the boot and it just looks class! It’s a bit dark out to post a pic now but will nab one tomorrow and post it up. Loving the grills, lots of positive comments about them so ordered a gloss black ‘X5’ badge which is on its way to tie in with ‘shadowline’ theme. Leaves me with a slight predicament regarding the ‘Xdrive’ and ‘30d’ badges on the side, one of which is looking a little tired anyway. Thinking I will remove them and give area a good polish over but wondering if in future when I come to sell it, is someone going to get all ‘it’s not OEM spec, why are they missing, has it been in an accident’ type comment?!? I am not sure - interested to hear others thoughts. My bits of trim around the exhausts are very tired and not responding to trim restorer at all! So considering changing the tail pipes to the trapezoid shaped ones of the LCI. BMW parts are super expensive and MStyles version is also £300+ so wondering if anyone can suggest a supplier of OEM ‘style’ there are loads on eBay but cheap rubbish which aren’t even the right shape. If I have to I will buy the genuine items but thought I would ask on here first, obviously in doing the tips I solved my tired looking trims which I understand have to be cut out to accept the later style?? 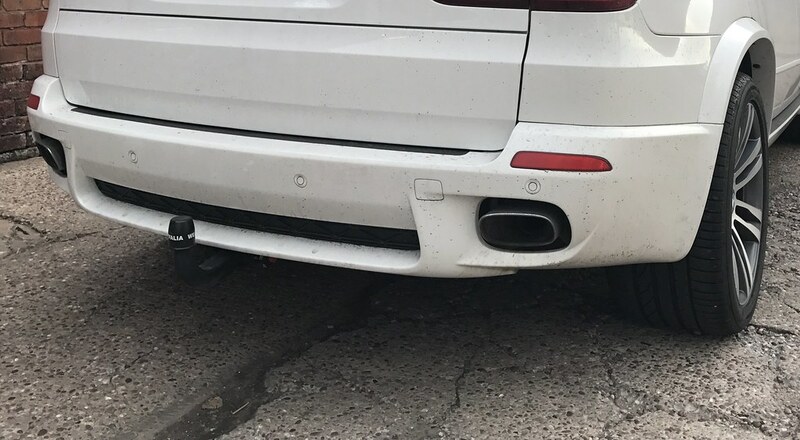 I went for the genuine BMW LCI tailpipes, some may think I'm mad at £310 from the dealer but I wanted a good fit and didn't want to get into welding etc. Takes less than an hour... just grind the old ones off towards the back box, slide these over and clamp them up. Look a lot better too. 2004 BMW X5 3.0d M Sport .... Gone! Does look so much better, I like that - did you have to cut the surround away from the round tail pipes or does it unclip? Was number removal required? ?